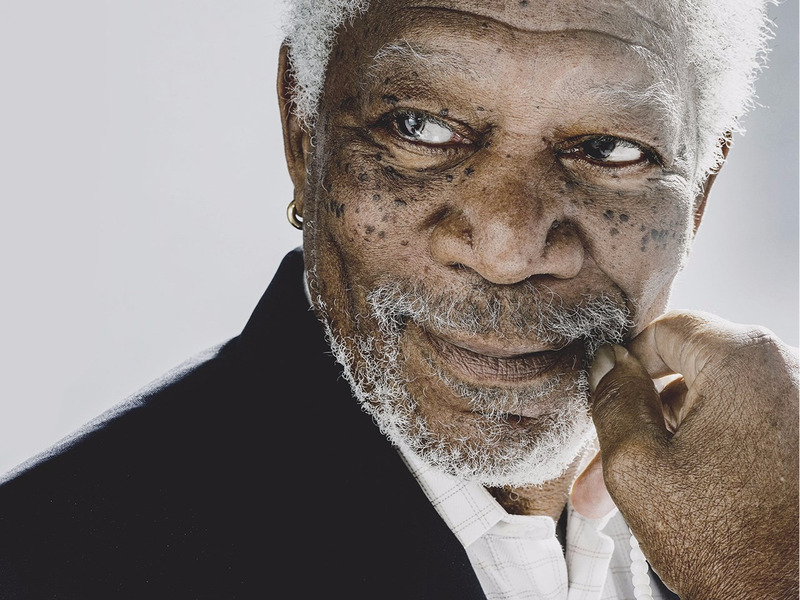 In Morgan Freeman’s new National Geographic show, “The Story of Us,” the Hollywood icon travels the globe interviewing a diverse multitude of people, including a few famous public figures, to shed light on the common bonds of the human experience. Business Insider spoke to Freeman and the show’s producers, James Younger and Lori McCreary, at a hotel suite in New York City. James Younger: I’ve done lots of work with documentaries where there isn’t an on-camera interviewer. As a producer, you sort of sit behind the camera lens and ask a bunch of questions, and that is an eye-to-eye conversation. But there’s something different about having Morgan on camera. Because he is Morgan, people tend to look at him and don’t think about the cameras, so it ends up becoming a very human conversation, a much stronger emotional connection. And Morgan’s so great at, you know, I guess, being an actor. He’s quite good at figuring out how to get people into these emotions. Lori McCreary: Drawing people out too. He draws people out in a way that sometimes we don’t even know where it’s going to go, and we get more information than we expected. Freeman: No, not at all. The military. It’s a necessary evil. I put it in those terms because we just launched our eleventh aircraft carrier. No other country in the world has more than one, and we have eleven. My feeling about the military is, as I said, it’s a necessary evil. We don’t need what we got. Personally, I think we’d do a lot better dealing with home, infrastructure, education. Look at Puerto Rico. We claim not to be able to deal with that? Horse-pucky. Younger: I’m not quite sure how we got in touch with her. It was through a contact who knew her. What’s really interesting about her is how she’s so adaptable. She’s kind of a self-professed troublemaker. Whatever’s going wrong, she’s going to say something about it. She’s in the US now, and she’s found a whole bunch of other stuff to get engaged with. She’s a motivator of people. She’s one of these people who is a magnet, attracts other people who feel the same way. Freeman: Yeah. It’s a certain kind of extant courage. There are people who thinkthings are wrong. And then there are people who have an absolute need to say it, to stand up and say, “That’s wrong!” She’s one of those. And I love the name. It makes a point. Lynch: At another point in the show, a homeless man in London says he recognizes you by your voice. As a viewer, it sort of felt like a “voice of God” moment, as people have described your voice. How does it feel to know that your voice spans the globe in that way? Freeman: I don’t think about it. Younger: “The arc of history is long, but it bends toward justice.” We started making this series before all the events of the last year, and we were making a film about tribalism, about how we all lock ourselves into different beliefs. And it was sitting down with President Clinton when he really crystallized that being about “The Story of Us,” and the story of them. And that we are always stronger when uscan expand and include them. So that was a powerful thing. Lynch: … what’s your secret to longevity in your life and career? Freeman: Discipline. Exercise, part of your discipline. How you eat, part of your discipline. I try not to overeat. One of the things that I discovered somewhere back down the line was that eating, for us particularly here, has become a habit, not necessarily a need. So if you try to keep it down to need, it’s going to be much better for you. You know there are more obese people in the US than probably anywhere else? Because we can feed them. And in the time in history when everybody had a job, an actually physical job to do — you get up in the morning, and you get your hoe or your axe or your saw, or whatever the tool it is that you’re using, and you use it. And then at noon, you stop using it and refuel, and then you use it some more, and then you go home, and you refuel. Aha! Now, let’s say you get up in the morning, and you brush your teeth, you comb your hair and put on a suit. And you go and sit down at a desk. You haven’t used up anything, comparatively. McCreary: And you’re refueling, even though you don’t need it. Freeman: Oh, wait a minute. There’s one more secret to longevity: Genes. Freeman: The point of the show, the point of telling people about people, is so that we can, on some level, reduce the amount of tension between people who don’t know each other. Younger: We live in a time of increasing tribalism. We, humanity, got to where we are now because of tribalism, because we knew how to group together and do things together as communities. And now, we’re in this phase where the all tribes are bumping up against each other, and we’ve got all this tension. And so we’ve got to get over that, this phase of tribalism, without losing our local culture. So the series is really about that. How do we get to know each other so we don’t have that animosity between cultures. McCreary: I think there’s some kind of human instinct to be with people that look like us, that like the same things as us, which is what James is talking about in terms of tribalism. And I think our show really highlights, instead of that instinct, the human spirit that is an outgrowth of these clashes we have because of our instincts. And the human spirit is what can take us out of that and into reconciliation in Rwanda, or in Bosnia. When I look at what happened in Rwanda or Bosnia, and then I think about how amazing their reconciliations are, then I look at America, and I think, okay, there’s hope, there’s definitely hope for us. If those countries can go through what they did and come out the way they did, then maybe we can also do the same.